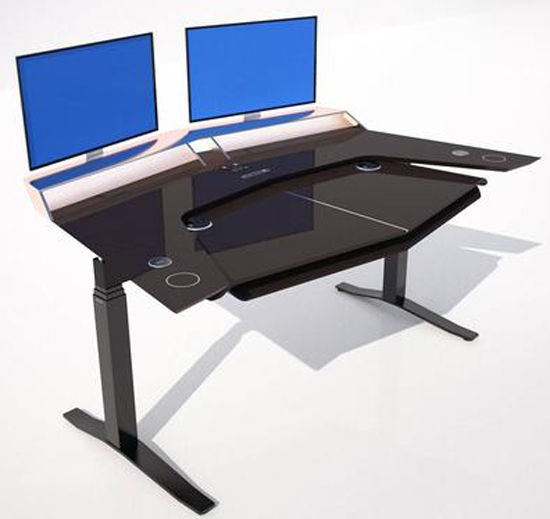 The team which revolutionised the humble office desk has now expanded its range to include a state-of-the-art desk for gamers. The Aerodesk, launched last year to great acclaim, is a masterpiece of ergonomics and technology which incorporates a LightBar to boost energy levels and hydraulic legs to convert seamlessly from sitting to standing. Now the design team behind it has taken the best of that technology to create the ultimate station for gaming fans. The new desk boasts a LightBar which can recreate daylight through its 5500 Kelvin frequency, a sub woofer Soundbar and two cup heater/cooler spots. It also has two USB plug points and two Qi chargers while providing the best of both worlds in terms of sitting or standing vantage points for ardent gamers. Conceived by feted designer John Tomalin-Reeves who created the First Class lounge at Heathrow’s T5 and revolutionised the barbecue market with his Halo Cooltouch, the Aerodesk is the first desk for the device generation. Now with professional gamers competing at similar levels to top athletes, John said it was the perfect time to introduce a desk which not only improved the overall experience but had key health benefits. “Gamers are notoriously spending long hours at a desk, there is no other option for them, and therefore have to think about their environment more and the potential impact on their health,“ he added. “The statistics are incredible,” he says. “Standing for three hours a day burns 30,000 extra calories per year, the equivalent of running 10 marathons. So why do desks need revolutionising? “If you took a snapshot of desks up and down the country they’d have common themes - trailing with wires, covered with devices and offering little or no inspiration,” John explains. “People think nothing of splashing out on their beds because they spend a third of their lives in them. We spend the same amount of time at our desks yet for some reason no one has ever designed one that you want to be at. Gaming is now a profession which is tied to a desk. Special chairs have been designed for gamers but people rarely think of improving their desk space which they are staring at all day. Studies have long linked excessive sitting to increased risk of cardiovascular disease and premature death. A recent study of 800,000 people found that, compared with those who sat the least, people who sat the longest had a 112 per cent increased risk of type 2 diabetes, a 147 per cent increase in cardiovascular problems and a 90 per cent increase in death from heart attack and stroke. Utilising hydraulic legs from celebrated Danish manufacturer Linak, the desk can move up to a height of 1365mm and glide down to just 695mm - not only enabling people to sit and stand, but also helping workers with accessibility issues.